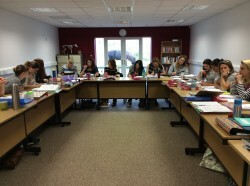 The nursing courses are run in partnership with Myerscough College, who provide administrative and educational support as well as a source of funding. The school consistently manages to achieve high passes in all courses, exceeding national standards. More details about the course can be found under 'Nursing courses'. To keep updated with the latest information from the Myerscough-Lynwood School of Veterinary Nursing, please visit our Facebook page.